*WDR 5 Neugier genügt - das Feature. 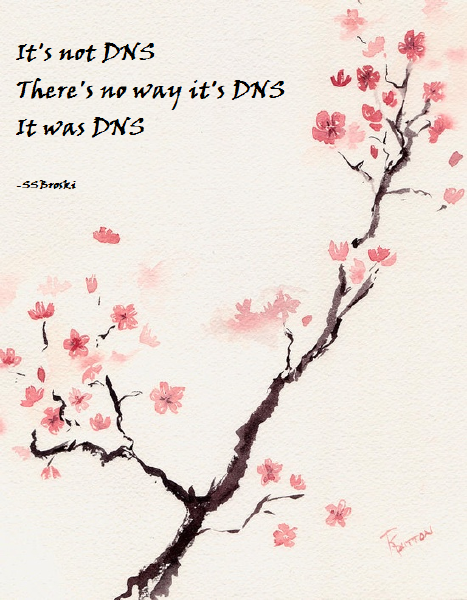 "Waves of #DNS hijackings over the past three months, aimed at consumer-grade routers mostly from #DLink have been diverting traffic from a number of well-known domains and directing them elsewhere." Cloudflare is using the next generation Quic internet protocol and the open-source Wireguard project as a base to build an advanced internet security service that could one day challenge incumbents in the multi-billion dollar enterprise VPN space. The Cargo or goods are transmitted through ships within the same country or from one port to another in the different countries in the Merchant Navy. The ships are widely used in import and export, from items as small as the needle to as large as airplanes. dotproxy (Github) is a robust, high-performance DNS-over-TLS proxy. It is intended to sit at the edge of a private network between clients speaking plaintext DNS and remote TLS-enabled upstream server(s) across an untrusted channel. dotproxy performs TLS origination on egress but listens for plaintext DNS on ingress, allowing it to be completely transparent to querying clients. By encrypting all outgoing DNS traffic, dotproxy protects against malicious eavesdropping and man-in-the-middle attacks. Robust, high-performance DNS-over-TLS proxy for encrypting DNS traffic. Several major Russian Internet companies, including Yandex and the news outlet RBC, suffered massive network attacks this week that were made possible by vulnerabilities in the system the federal government uses to block websites. Sources told RBC that the perpetrators carried out DNS attacks, hijacking domain name system servers and domain registrars to direct traffic away from legal websites, like Yandex, to IP addresses that have been blacklisted by Roskomnadzor, Russia’s state censor. Möchtest Du Fernzugriff auf Deinen Raspberry Pi aus dem Internet haben, gibt es dafür mehrere Möglichkeiten. Sehr einfach ist es mit DuckDNS.org. Regardless of whether it is treating your eyes to the most excellent first light and sunset over an open skyline or tallying the jewels spread on the sea on a full moon night, a career in merchant navy surely has one of the most adventurous work life very few professions can offer. Recent rash of DNS hijacking attacks has spurred ICANN to urge the industry for a more rapid DNSSEC adoption. My #dns servers are getting killed by RRSIG request from google IP's out of europe. Anyone know why the heck google or any dns system would check my RRSIG 100 times a minute? Mit Pi-hole kann man das heimische #Netzwerk von Trackern und #Reklame befreien. Wer noch einen Raspberry Pi herumliegen hat, sollte den dafür reaktivieren. Es lohnt sich. Wer heutzutage eine kommerzielle Website aufruft, lädt nicht nur Text und Bilder. In der Regel rufen Spiegel Online & Co. Dutzende externer Dienste auf, um Reklame anzuzeigen, die Performance der Seite zu analysieren und die Daten an Datensammler weiterzugeben. So verdienen die ihr Geld. Man kann dagegen #AdBlocker einsetzen oder Plugins wie den Privacy Badger der EFF. Oder man setzt ein Stückchen weiter vorne im eigenen Netzwerk an und filtert direkt am Router. Pi-hole ist eine Software für den Raspberry Pi, die DNS-Anfragen mit Block-Listen abgleicht und Anfragen von bekannten Trackern gar nicht erst weiterleitet. Normalerweise fragen Browser einen #DNS-Server, unter welcher IP eine www-Adresse zu finden ist. So wie man im Telefonbuch nachgeschaut hat, welche Telefonnummer Frau Müller hat. Das macht der Browser nicht nur für zum Beispiel spiegel.de sondern auch für all die Reklame-Elemente und Tracker, die spiegel.de zusätzlich lädt. Statt die Anfragen direkt an einen normalen DNS-Server zu stellen, leitet man die Anfrage an Pi-hole. Pi-hole schaut dann nach, ob die Adresse auf einer Liste bekannter Tracker und Reklame-Server auftaucht. Wenn nein, wird die Anfrage an einen richtigen DNS weitergeleitet. Wenn ja, stoppt Pi-hole die Anfrage. Auf diese Weise hat Pi-hole heute ein gutes Viertel aller Internet-Zugriffe aus meinem Netzwerk gestoppt. Bei einem Viertel aller DNS-Anfragen ging es um Tracker oder Reklame! Pi-hole zu installieren ist wirklich einfach: Du brauchst einen #RaspberryPi i samt Netzteil, SD-Karte und Netzwerkkabel. Die SD-Karte formatierst Du an Deinem richtigen Computer. Du lädst Dir NOOBS herunter, packst es aus und kopierst es auf die SD-Karte. Karte in den Raspi, Kabel dran, Monitor, Tastatur und Maus. Nachdem der Raspi NOOBS gestartet hat, wirst Du gefragt, welches Betriebssystem Du installieren willst. Nimm Raspbian Lite – das reicht. Nach einer viertel Stunde ist Raspbian installiert und Du kannste den Raspi neu starten. Nachdem Raspbian gestartet ist, kannst Du Dich mit pi/raspberry einloggen. Die Installation dauert einige Zeit. Ein paar mal wirst Du nach Einstellungen gefragt, aber die voreinstellten Settings sind ok.
Nach der Installation läuft auf dem Raspi ein Webserver mit den Einstellungen und des Statistiken. Wenn Du die IP des Raspis im Browser aufrufst, wirst Du dort hin geleitet. Im Router musst Du zum einen einstellen, dass der Raspi immer die gleiche IP bekommt. Zum anderen stellst Du diese IP dann als primären DNS-Server ein. Danach kannst Du Dir in der Statistik anschauen, wie Anfrage um Anfrage gefiltert wird. Dabei sind das natürlich nicht nur die Anfragen, die Du im Browser auslöst. Dein Smart-TV funkt nach Hause, die Apps auf Deinem Handy machen das, selbst der Treiber Deiner Grafikkarte macht das. Bei mir werden zurzeit 26% aller DNS-Anfragen von Pi-hole abgefangen und bemerkt habe ich nichts – alle Seiten, die ich aufgerufen habe, funktionierten weiterhin ohne Probleme. Über ein Viertel aller Anfragen sind überflüssiger Scheiß! Scheiß, der Bandbreite verbraucht und Energie auf Servern und meinem Rechner! Macht das auch: Filter die Scheiße aus dem Netz! Der Beitrag Pi-hole filtert den Scheiß aus dem Netz erschien zuerst auf kaffeeringe.de. Der Entwickler des Allzweckwerkzeugs Curl will mit DNS über HTTPS allen Internet-Nutzern endlich zu abhörsicheren DNS-Anfragen verhelfen. Ende Januar kam es zu weltweiten Ausfällen in der Microsoft-Cloud. Nun hat das Unternehmen einige Ursachen bekannt gegeben. Die Übertragung von DNS-Informationen über HTTPS sei nicht nur sicherer als Alternativen, sondern vor allem gut für den Endnutzer, sagt Curl-Entwickler Daniel Stenberg. Diasporing.ch is always improving! Now with even faster dns queries and better DDoS protection thanks to dns fast anycast! A flag day for DNS is coming on February 1; it may have escaped notice even though it has been planned for nearly a year. Some DNS servers will simply be marked as "dead" by much of the rest of the internet on or after that day, which means that domain owners need to ensure their DNS records will still be available after that point. A longstanding workaround for non-compliant servers will be dropped—mostly for better performance but also in support of DNS extensions, some of which can help alleviate security problems. Hersteller von wichtigen DNS-Resolvern wenden sich gegen veraltete Server und Netzwerkgeräte. Manche Webseiten wird man ab dem 1. Februar schlechter erreichen. Amid a partial shutdown, DHS gives admins 10 business days to lock down their DNS. DHS lays out four-step action plan for investigating DNS hacks and securing DNS management accounts. Check your domain DNS now! "it's worth reminding admins that websites on unready hosts, along with big resolvers and #DNS software vendors, need to be ready for "Flag Day", around February 1 2019." The current DNS is unnecessarily slow and suffers from inability to deploy new features. To remediate these problems, vendors of DNS software and also big public DNS providers are going to remove certain workarounds on February 1st, 2019. This change affects only sites which operate software which is not following published standards. Are you affected? Also public DNS providers listed below will disable workarounds. For introduction to EDNS compliance we recommend you to use form above which produces simplified result for a whole domain. It is also possible to test your DNS servers directly using the tool ednscomp which displays detailed technical report. Simply enter the name of a zone hosted on your DNS servers into the zone name field and click the Submit button. The summary result of ednscomp tests should preferably be a green message All Ok. Minimal working setup which will allow your domain to survive 2019 DNS flag day must not have timeout result in any of plain DNS and EDNS version 0 tests implemented in ednscomp tool. Please note that this minimal setup is still not standards compliant and will cause other issues sooner or later. For this reason we strongly recommend you to get full EDNS compliance (all tests ok) instead of doing just minimal cleanup otherwise you will have to face new issues later on. To remediate problems please upgrade your DNS software to the latest stable versions and test again. If the tests are still failing even after a DNS upgrade please check your firewall configuration. Firewalls must not drop DNS packets with EDNS extensions, including unknown extensions. Modern DNS software may deploy new extensions (e.g. DNS cookies to protect from DoS attacks). Firewalls which drop DNS packets with such extensions are making the situation worse for everyone, including worsening DoS attacks and inducing higher latency for DNS traffic. The main change is that DNS software from vendors named above will interpret timeouts as sign of a network or server problem. Starting February 1st, 2019 there will be no attempt to disable EDNS as reaction to a DNS query timeout. This effectivelly means that all DNS servers which do not respond at all to EDNS queries are going to be treated as dead. Please test your implementations using the ednscomp tool to make sure that you handle EDNS properly. Source code of the tool is available as well. It is important to note that EDNS is still not mandatory. If you decide not to support EDNS it is okay as long as your software replies according to EDNS standard section 7. Please read respective methodologies before interpreting the data. In any case, do not hesitate to reach out to tool authors using Gitlab links above. https://www.ctrl.blog/entry/secondary-dns-comparison "A secondary DNS server is often referred to as a “backup name server” or “backup DNS”."